^ Greenfield, Robert (1981). The Rolling Stone Interviews - Keith Richards. New York: St. Martin's Press/Rolling Stone Press. ISBN 0-312-68954-3. ^ Jagger, Mick; Richards, Keith; Watts, Charlie; Wood, Ronnie (editors: Loewenstein, Dora & Dodd, Philip) (2003). According to he Rolling Stones. Chronicle Books. p. 40. ISBN 0-8118-4060-3. ^ Wyman, Bill (2002). Rolling With the Stones. DK Publishing. pp. 36-37. ISBN 0-7894-9998-3. ^ Bockris, Victor (1992). Keith Richards - The Biography. Poseidon Press. pp. 42-43. ISBN 0-671-70061-8. ^ Wyman, Bill. (1990). Stone Alone: The Story of a Rock 'n' Roll Band. Da Capo Press. p. 123. ISBN 0-670-82894-7. ^ Jagger, Mick; Richards, Keith; Watts, Charlie; Wood, Ronnie (2003). According to the Rolling Stones. Chronicle Books. p. 62. ISBN 0-8118-4060-3. ^ Hinckley, David; Rodman, Debra and Coral, Gus (1995). The Rolling Stones: Black & White Blues. Turner Publishing Inc.. ISBN 1-57036-150-9. ^ Outlook Club Advertisement - picturestockton Archived 2011年10月8日, at the Wayback Machine. ^ "The Hollywood Palace"TV.com. Retrieved 1 June 2007. ^ Wyman 2002, pp. 264-265. ^ Wyman 2002, pp. 278-282. ^ Booth, Stanley (2000). The True Adventures of the Rolling Stones (2nd edition). A Capella Books. pp. 271-278. ISBN 1-55652-400-5. ^ Wyman 2002, pp. 292-293; 299. ^ Wyman 2002, pp. 296-298. ^ DeCurtis, Anthony (17 June 1997). “Review: Beggars Banquet”. Rolling Stone (New York). オリジナルの2002年1月31日時点によるアーカイブ。. https://web.archive.org/web/20020131191122/http://www.rollingstone.com/recordings/review.asp?aid=49080&cf=422 2013年7月9日閲覧。. ^ a b The Rolling Stones (1969年). The Stones in the Park (DVD released 2006). Network Studios. ^ "Sticky Fingers" allmusic. Retrieved 2013-03-02. ^ "Reviews - The Rolling Stones" Robert Christgau. Retrieved 30 August 2007. ^ "Exile on Main St." AMG, 2007. Retrieved 2013-03-02. ^ Erlewine, Stephen Thomas. The Rolling Stones "Goats Head Soup". allmusic. 2007 . Retrieved 17 June 2007. ^ "Mick Taylor Biography" allmusic. Retrieved 25 June 2007. ^ Smith, Curtis. 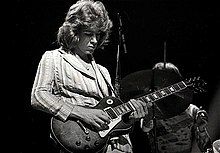 "Why Mick Taylor Quit the Stones" micktaylor.net. Retrieved 25 June 2007. ^ Jagger, Richards, Watts, Wood 2003. p. 174. ^ McLagan, Ian (2000). All the Rage: A Riotous Romp Through Rock and Roll History. St. Martin's Press. ISBN ISBN 0-8230-7842-6, 9780823078424. ^ Keith Richards. (2010). "Life" Hachette UK, 2010. ^ Bowie/Jagger Vidclip Heads for Movie Screens p.1. Billboard (24 Aug 1985). ^ "Voodoo Lounge" AMG, 2007. Retrieved 2012-07-13. ^ Rolling Stones Live on Internet: Both a Big Deal and a Little Deal. The New York Times, 22 November 1994. ^ "Q - 50 Bands You Must See Before You Die" rocklist.neyt, September 2002. Retrieved 7 June 2007. ^ "Some US retailers join Stones boycott" CNN, November 2003. Retrieved 14 June 2007. ^ "A Bigger Bang: Review" Rolling Stone, 22 September 2005. Retrieved 14 June 2007. ^ "Stones 'slate Bush' in album song" BBC News, 2005. Retrieved 16 October 2007. ^ “アーカイブされたコピー”. 2013年7月21日時点のオリジナル[リンク切れ]よりアーカイブ。2012年5月19日閲覧。 CNN News, 2005. Retrieved 27 November 2007. ^ "Keith Richards and the Fiji fall: The mystery deepens" Uncut. Retrieved 5 October 2007. 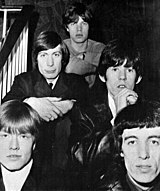 ^ "Stones Roll to Universal in New Deal"[リンク切れ] Yahoo! News, 25 July 2008. Retrieved 25 July 2008. 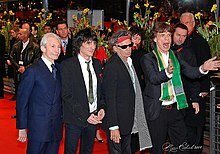 ^ El Universal Spanish  "Rolling Stones se uniran a las estrellas en la meca del cine europeo"
Richards, Keith; Fox, James (2010). Life. Weidenfeld & Nicolson. ISBN 9780297854395.